On paper, the game was set to be a good one. In reality, it lived up to the expectation. 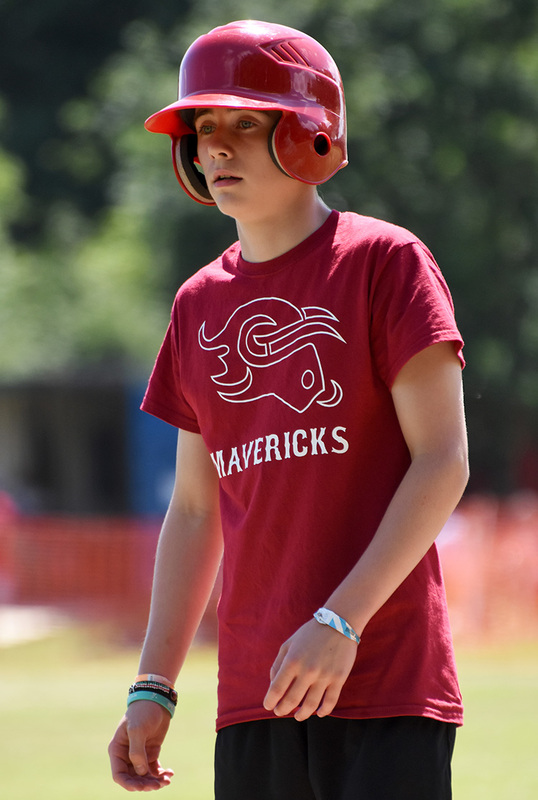 The Mavericks were still suffering with a few players being on the disabled list but they made the trip to Grovehill Park taking one person for the bench. 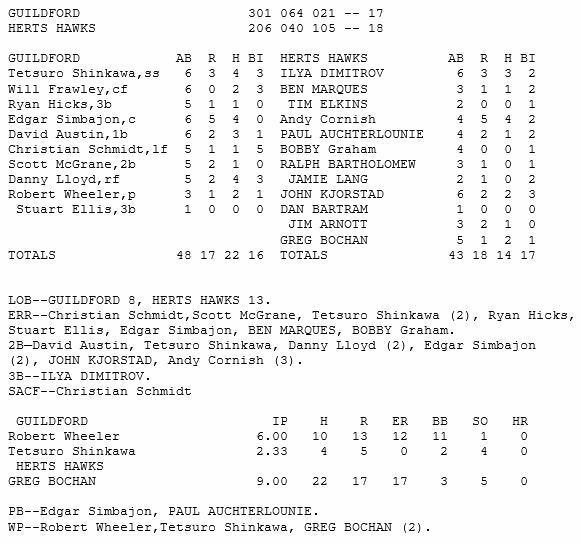 Herts had a flawless record to beat and the team started well by getting at Hawks pitcher Greg Bochan for three early runs in the first, two batted in by centre fielder Christian Schmidt. Rob Wheeler started on the hill for Guildford and had a rude awakening when Ilya Dimitrov crushed the second pitch barely into fair territory in deep left field for a loud triple. Andy Cornish batted him in and following a calmer second inning where the pitchers were settling in the score was 3-2 to the Mavericks entering the third. Herts came out swinging to load the bases with no outs. John Kjorstad batted a runner home with a hard hit line drive into left centre and the home team plated six runs from four hits to take the lead. Both teams batted around in the fifth inning. This was a joy to watch as the hits just kept on coming from both teams. Catcher Edgar Simbajon started the six run Maverick inning with a single to centre field and first baseman Dave Austin followed it up by hitting a RBI line drive double. The bottom of the order got into the fun of the hits with Scott McGrane legging out an infield single and the next two batters; Danny Lloyd and Wheeler ensuring the Hawks outfield were kept busy by hitting ground balls which found the holes and had some zip. Tetsuro Shinkawa knocked Lloyd home with a well hit double from a great at-bat where he frustrated Bochan by fouling off several pitches on a 0-2 count. Frawley recognized his pitch to hit a two run single before the side was retired. Boosted by this offence, Guildford had re-taken the lead and needed to keep Herts at bay. Wheeler lost some command and some batters were walked but only four crossed the plate but that was enough for the momentum to go to Herts who led 12-10. Both benches were loud in their cheers and some great baseball was being played in both offence and defence. Bochan and Wheeler were evenly matched. 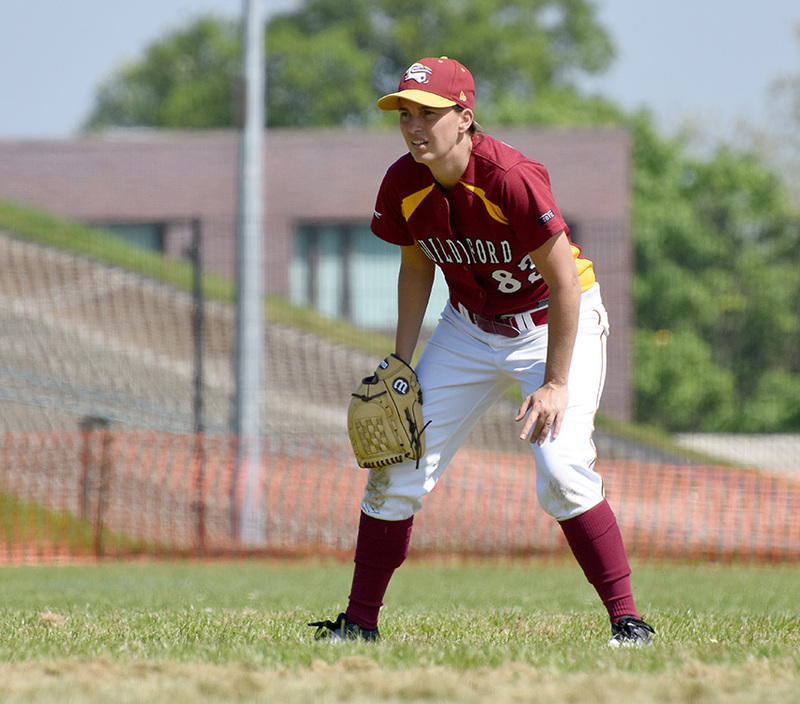 The Mavericks had a good sixth inning by plating four runs in the top of the inning with the highlight being a diving catch by right fielder Lloyd who battled a high fly ball swirling in the air and took away a sure double from Bochan. 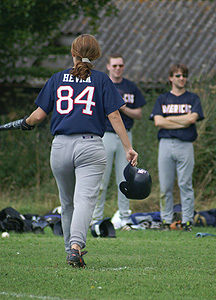 Herts were stifled to only scoring one run in the sixth, seventh and eighth inning. 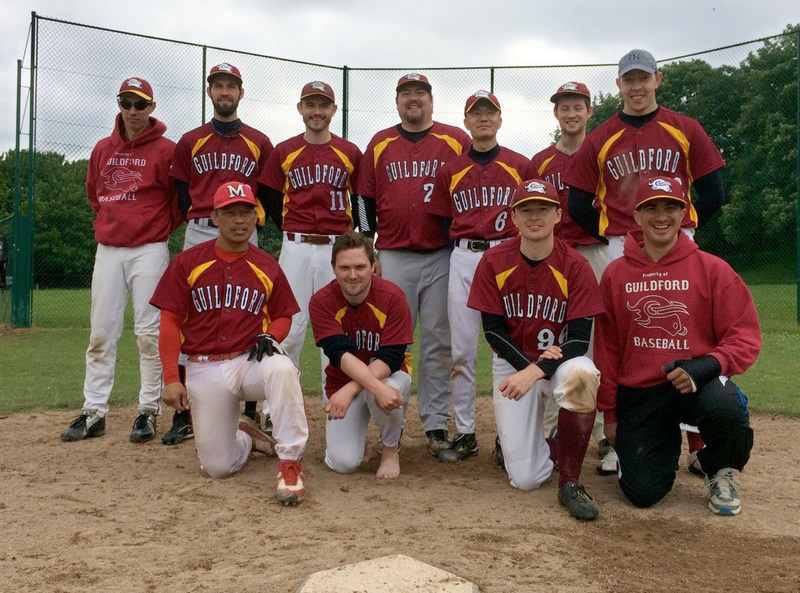 With the score 17-13 to Guildford entering the bottom of the ninth, Herts had to pull something big out of the bag to get the win. Shinkawa, who had taken over as pitcher in the eighth struggled to find the form in the previous inning where he had set the side down in order and with a couple of timely hits by the home side the bases were loaded with the scores tied and one out. 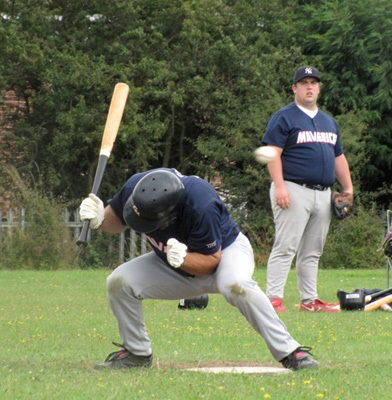 The Mavericks manager pulled both the infield and outfield in with the winning run on third base but Tim Elkins showed good composure to gain a walk that ended the game at 18-17 to Herts. Edgar Simbajon battled a pulled muscle but proved himself again batting in the clean-up spot. He ran the bases for every plate appearance and went 4-4 with three doubles, two walks, two RBI’s and five runs. Danny Lloyd also had a game to remember with not only his glove work but by going 4-5 with two doubles, one of which bounced off the top of the wall in right field. It was a big shame that the Mavericks could not hold onto the lead but they out-hit Herts 22-14 and gave them their toughest game of the season. Guildford now have a two week break before travelling to Bracknell.